Discussion in 'Project Logs' started by JaPeMo, 1 Sep 2013. My first experience with NZXT Switch 810 worklog, BnB, finish in problems and accident I had at the end of the mod, I decided to open a new thread with the new project. I had a low moral and I was pissed that they took away my desire to do something great and personalized. There have been many hours and nights reversed. I'll be back with more desire to finish what I started . This mod will be something more simple and not as farfetched as above, but I be sure, that will be better. This time, I 'm going to adhere to the ideas and script that I have already written a paper. No improvise , then you know . I hope you like the project. A greeting! Top pump: Aquacover dual DDC - Top for 2 pumps - Acetal G1/4"
I have moved this thread until there is evidence that it is underway, ie pictures of the build. Once they are up I will move this back to project logs. But, after, I think that change all front & top panel, like TJ07 modders, why not? I made ​​this design for VGA in 3D. But it has a problem with my motherboard assembly. Each plate have 3mm thick. When two plates are 6mm plus free space. I currently which is 4 plus free space, and I had to reduce it by the USB 3.0 connector. Therefore, this design that I put this complicated thing. It could cut, but just in that area / corner there is a screw, the upper right. So my first choice is still full cover plate black with blue lettering to illuminate them from behind. As had now, but without using vinyl comes off with screws. Well guys, I bring you news, Papa Noe arrived! That's it until Monday. I have to leave the weekend off for personal reasons. looks good, cant wait to see updates! Well guys , I finally had some time tomorrow is party advantage to open the packages , so here we go for slaughter . Radiators. I am surprised its matte black finish . Perfect for the mod and to match the case . The 140x3 . This has been quite marked with friction . But hey , it's pretty superificial . The tube. It is quite more seen against the light blue . I think I had before is turquoise / lilac . Opening the box we find a box containing the legs ( the cambiare by wheels ) , 2 switches Lamptron (I've ordered the 2 blue ) , screws for HDDs / other and USB 3.0 connectors . This we will see if there is a change that I have in mind. The details of how you caught the window methacrylate . You milling milling . The bolts are the most for Curran could have a more beautiful finish . We'll see if there are changes with blind nuts here ... In the beginning was to change the blue UV acrylic one . But to go milling is perfect and aligned with the panel. So I'll leave it well this time . To remove the sides need a screwdriver / allen key . As I have Swith screws looketh if you are worth and cambiare . I present 140x2 radiator and I'm the first surprise ... NONMATCHING HOLES , so does the 140x3 . The Koolance carry a separation of 20mm while 16mm box . This really is not a problem if you change the front and top panel as I have thought of myself. A part with the screws touch the radiators positions therefore may suffer the odd scratch or bun screws. Another thing to keep in mind when designing . 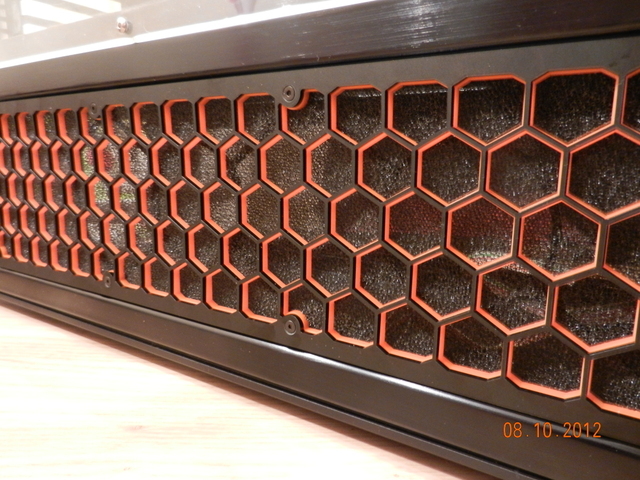 Here we can see that it can regulate 5mm more or less according to the need of the fans and radiator. And here is the box with nothing ... Only the main structure. The truth is very wide and with a content size . Finishing touches the photo report now design the top and front panels , painted fans, study some things and dimensions. But all this and seeing what you will go slowly . I have to say I like the look of the thin black layer over the orange hex. I have been all weekend giving BnB mod. Not change the end panels . The main reason for the change was that it did not overlap the distance between fans and therefore the holes. But I happened to catch the file and make the hole a tad longer , instead they were circular. And the result has been good , with consequent savings ! This place still no where lol, something so small. Surely nearly of aquaero or pumps.. The pumps and top with more detail. I have to turn the pump so that the cables go forward. The solution that had , and still think how to do it without touching the box ( trim, not shoddy power , and had the switch for it, ) is to raise the box HDDs keeping silent blocks . They won it in the bottom space and not have to do so much jog , climb down as I do now also , as I said before, a drain in the lowest point of the circuit. The invention that I have assembled to place the deposit which suits me for the RL . Scraps of laser grid that held before ( switch) the same tank ... The white is the protective plastic . Nothing guys hope you liked it!! I bring you news of the weekend . They are few and it has taken me a long time painting, re- organization of the RL and the theme upper radiator support . That in the end I'll leave it as it is to have to make , say " odd jobs " . The painted valves, Fittings and adapters, screws and fans . This vetch I used primer and you want to tell . At the screws have stripped paint and I had to sand back and repaint , this time without primer and have been much better , more like box matte black . The theme of the front radiator support. Do not know if I said it before , but it only are attached to the front grille. I am going to put a filter on the inside so when you want to clean these filters , radiator with the 4 fans , fittings , etc. ... goes off . So I 've managed with a L and I have done some internal support ... The rivet wanted him put in reverse , but then my turn and I doubt that would come later. So out. Later I will put a cover. We begin with the study of the RL . As I missing links, elbows and such, I had to improvise and piecewise fabricarme parts to check its correct position . I have already solved the issue fillport valve and discharge / drainage system . Besides being the lowest point of the entire system , which will complete emptying , but it is at the bottom of the radiator . As you can see in the following picture , the valves and adapters and are painted . The filter as comment, you colocare on the back side , just off the upper radiator to so view it through the window. The filters , which added to the 4 that I have , the dust will not be as present inside the box. Grids . In the end I opted for these , no custom grids . Why? Because I like to be bastnte classic and simple. On the other hand to be universal and can be used in the future. Whilst I love the look of what you've done; the watercooling equipment, custom cabling etc. I really think the Maximus V board really ruins that blue theme you've got. I think an asus P8Z77 board would've really looked the part here. The Maximus is great for performance; but for pure aesthetics, it looks out of place. Methacrylate plate was left a hole is underneath and has ocurido m as placing a plaque and the idea is that the LED is on, in other words, will be lit while the pc is turned on .. Seemed to be clear the position of the HDDs , well, the dilemma comes in that box weighed hard drives , and I do not trust that you flying with something made ​​by me. Total , this morning and almost all day yesterday, moving hard drives , storage , pumps ... crazy. In the end I found a possible sloucion and that also is great for the bypass . Problem , the bomas are very close to the radiator . Is to change the order of things . That is, the HDDs are now paid alinmentacion source . Problem to be the warehouse , just past, justito . I have no pictures of the rest , I missed completely. It is that now the warehouse has to empty side. The pump will be right below , and here is where the first problems I encounter . Being so close to the radiator / fans , almost no place to put 2 fittings . It could pump Fittings together with the radiator, but these , I transmit sound vibrations and as consequence . Another problem I see , Hard Sayings of placing the well , is that if you want to get any, have to remove a lot of things , including RL . I leave it for today , I will rest and big beer ! ! Finally today I was able to spend some time to mod and I focused on the position of the HDDs and so settle the matter once and for all. As you have seen is quite high , is to pass the tube above the pumps. And finally , I show the idea of ​​the bypass on the radiator to drain the circuit 9X % . I say the 9X % because there is always something. I just need a T, another valve and some recoreria adapter . I thought I would fail more . 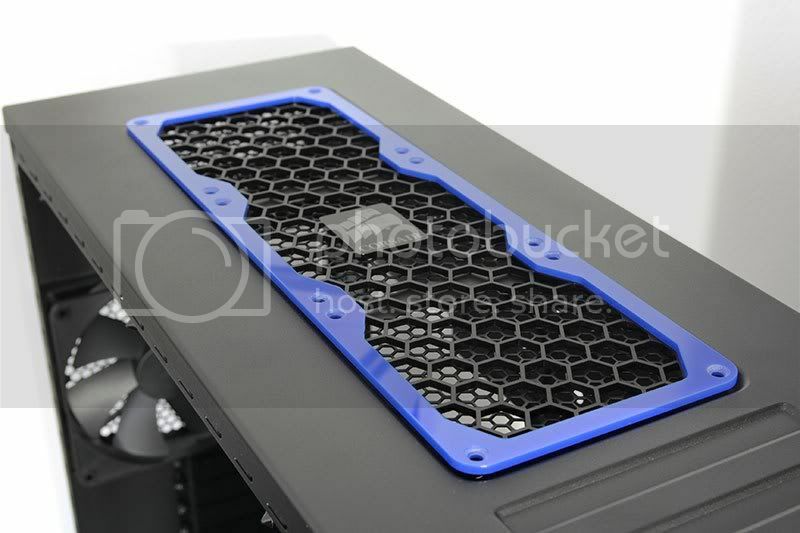 I'm aware of some new backplates for VGAS . The current , to be vinyl , remove and replace both have been off / scratched in some areas . No place if all black and the same design I had. Struggling to see why that case costs over 400euros. Today I have put a little bit with the mod.